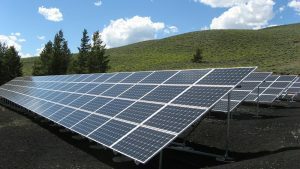 Although more and more homes in the United States are utilizing solar fields, the majority of solar field projects are utility-scaled, requiring huge tracts of land that are made into barren areas virtually unlivable to most wildlife. Some solar companies are beginning to try and change that, however, and one of the best ways is with solar fields and pollinators. It is a fairly simple process to implement pollinator habitats focused on native plants in the areas surrounding solar panels. This has some pretty incredible benefits to the solar fields themselves and the surrounding environment. 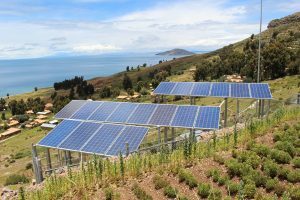 Solar projects around the world have begun planting native perennial ground-cover, mostly wildflowers and meadow grasses, in the spaces underneath and between solar panels. This is a relatively recent trend, however there are some strong benefits that have already become apparent. Many native pollinator plant species such as clover, butterfly weed, and black-eyed susans are extremely resilient in most conditions. They establish strong root systems that help to control stormwater runoff which is a large problem in most solar fields. Interestingly enough pollinator plantings surrounding solar panels help increase efficiency by helping to keep the panels cool during the day and warm at night. Once established, these wildlife habitats also cut down on maintenance costs by only requiring a quarter of the mowing that turf grass would need. Pollinator habitats in solar farms are clearly cost savers on several levels. These native plantings also contribute to the surrounding environment in other ways. One of the biggest problems facing our native pollinators is the loss of habitat. In fact, many of our native bees can only forage a few hundred yards away from their nest, making large areas of empty or overdeveloped land uninhabitable. Many of our native species are confined to wild patches in between areas of cultivation or development. Even though many native pollinator species are limited in their habitats they are still able to contribute hundreds of millions of dollars a year to our agriculture industries through pollination alone. Planting native flowers and meadow grasses in solar fields can help in connecting some of these wild areas together, giving wildlife the opportunity to travel to and from areas that were previously inaccessible. The overall reason this is so exciting is that large-scale industries are starting to shift their views towards conservation wherever possible. Thanks to the steps that ecologically-minded farmers all over the world have already taken in their own operations, we can see some of the benefits that a well-functioning ecosystem can bring to our lives and wallets, such as increased fruit and vegetable yields and lower pest management costs. A healthy ecosystem is a well-oiled machine that requires very little outside influence in order to function properly. These pollinator habitats take a step in repairing habitats lost through urbanization and help to repair the functionality of the blooming and buzzing world around us. As solar sites planted with native plants flourish, hopefully more developers will catch on and develop their own sites in similar ways. Minnesota is currently taking the largest strides toward making the land around their solar industries native plant focused instead of using turf grass or bare soil. The solar industry in North Carolina is also flourishing and has another opportunity to make a name for itself as a leader in forward environmental thinking. As far as land development goes, establishing an area that generates power while at the same time providing habitat for valuable native species is a win-win. We are using WordPress with a special plugin. Reach out to us at info@sprigglys.com and we’ll give you some info.